The program spans a semester or a school year, and includes two half-day workshops. In each workshop, an octet of St. Martin’s singers joins the participating high school choir and its director under the direction of St. Martin’s Artistic Director, Tim Krueger. While the two choirs may perform informally for each other, the majority of the time is focused on sight-reading advanced choral repertoire, proper tone production, adding expression and achieving ideal blend. The students also come away with the realization that the choral experience can extend long after high school or even college. The culmination of the Residency Program occurs when the school choir collaborates with St. Martin’s in a regular St. Martin’s concert. The school choir not only performs a piece or two of its own, but also sings with the St. Martin’s singers. This provides a singular and memorable experience not only for the high school students, but for the St. Martin’s singers and their audience! 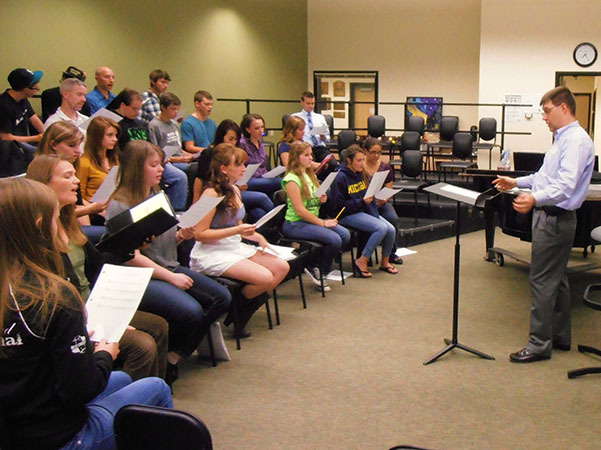 St. Martin’s Chamber Choir continues to offer the high school Residency Program to selected high schools. The high schools invited to participate are chosen by the Artistic Director, Tim Kreuger. Due to the high level of choral skills presented, the school’s most advanced choir is preferred, and the school’s choral music program should be already well-established. While the criteria are high, the program is offered free of charge to the high school selected. If you are a high school choir director and feel that your choir meets these criteria, please feel free to contact St. Martin’s to discuss a possible future Residency Program with your students.